Celtic Prehistoric Artworks in Ireland: Hallstatt, La Tene Style. The Iron Age (c.1100-200 BCE) was marked by the smelting of iron ore into the metal iron. Far stronger and durable than bronze, whose introduction had characterized the previous Bronze Age (c.3500-1100 BCE), it gave whoever possessed it a significant advantage in terms of weaponry and engineering. By around 1100 BCE, the Celts, an Indo-European group of tribes had established themselves in a controlling position astride the main trade routes along the river systems of the Rhone, Seine, Rhine and Danube. Between 1100 and 700 BCE, they were the first non-Mediterranean people to develop iron which gave them the technological edge to colonize their neighbours throughout the Continent. Although there had been intermittent contacts between Celts and the native Irish during the Stone and Bronze ages, the first specific wave of iron-using Celts arrived in Britain and Ireland around 500 BCE. The first group of invaders were members of the Hallstatt Celtic culture, to be followed, two hundred years later, by Celts of the La Tène cultural group which developed from the earlier Hallstatt culture. As a result of both these intermittent and invasive contacts, within a few hundred years Ireland's Bronze Age culture was almost completely superceded by Celtic culture throughout the entire island. The Lebor Gabála Erenn, more commonly called the Book of the Invasions of Ireland, is a compilation of myths and stories concerning the origins of Ireland. It refers to a number of invaders of the country, such as the tribes of Cessair, Partholons, Nemesians, Fir Bolg and Tuatha De Danann. Some of these invaders may well be Celts. The word "Celt" derives from the Greek "keltoi", a term used by the Greeks to describe the tribes on their northern borders. Recent DNA research indicates that these loosely-knit Celtic peoples were not united by common genes. Furthermore, their invasions never coalesced into an empire. Nevertheless, their influence extended throughout France, Germany, Austria, Switzerland, Hungary, Slovakia, and was especially significant in terms of culture and art. European writers confirm the presence of Celts in Ireland. According to fourth-century accounts by Carthaginian, Roman and Greek historians, Celts were already established in Ireland - a country which was incidentally known to the historians as Insula Sacra [Holy Island], and whose inhabitants were called gens hiernorum, deemed to be a Latinisation of the Greek word for Ireland, 'Ierne'. Scholars believe 'Ierne' to stem from the word Ériu, which may be an original Celtic word for Ireland. In any event, the Greek historian Pytheas refers to the British Isles as the Pretanic Islands, an expression derived from the word "Priteni" which was certainly a Celtic word. In any event, La Tène culture (named after the excavations at La Tène close to Lake Neuchâtel in Switzerland) spread throughout Ireland, promoting its distinctive art style of abstract geometric designs and stylized bird and animal forms. This style of Celtic art owes a great deal to the Mediterranean culture of the Greek and Etruscan civilizations and continued to flourish in Britain and Europe (c.450-50 BCE) during the late Iron Age until the advent of the Roman Empire. Celtic-style monumental art also made its appearance in Ireland during the period 300-0 BCE. Numerous carved stones - 2 metres tall and almost certainly ritualistic monuments of some kind - were assembled at various locations around Ireland and displayed a series of intricate swirling patterns very similar to Continental European Celtic culture. The best surviving example is the Turoe Stone in County Galway. Unfortunately, from a cultural perspective, Iron Age Ireland had little of the physical or commercial security needed for the serious development of art, as in Etruria, Rome, or Greece. Indeed, Irish culture was based largely around war and conquest. The country was ruled by about 150 kings, each ruling a small kingdom (tuath). The kings made up a set hierarchy. A "rí túaithe" was the king of one kingdom; a "ruiri" was the king of several kingdoms; a "rí ruirech" was an 'over-king' who ruled an entire province. Ireland consisted of up to 10 provinces (Ulster, Munster, Leinster and Connacht being the final result) depending on how much power the rival kings gained for themselves. Located in each province was a royal fort, used for ceremonial and religious gatherings. Examples include: Emain Macha, in County Armagh; Tara, in County Meath and Dún Ailinne in County Kildare. As a result, a significant number of the Irish artifacts of this era were no more than a reflection of the prevailing militaristic culture. 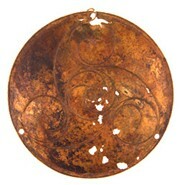 For example, ceremonial drinking vessels, simple jewellery (necklaces, hair pins), weapons and other Celtic metalwork were created by blacksmiths and other metallurgy craftsmen; poets and bards were encouraged to celebrate a kingdom's successes in verse; lesser craftsmen produced pottery for ceremonial and practical uses, and Druids (the learned class in Celtic culture) interpreted stellar and lunar events, and divined the will of the gods. However, while Irish Iron-Age art may have been primarily decorative or ritualistic, and may have lacked the delicate beauty of European Celtic artworks such as the Hallstatt hairpins decorated in amber, jet or coral, it could still attain a high level of intricacy. Examples include: the La Tène style Petrie crown and the Broighter Collar, as well as the golden Gorgets and the precisely executed decoration and designs on the stonework of the Turoe stone. 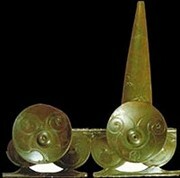  For information about the cultural history of Iron Age Ireland, see: Irish Art Guide.  For more on the history of Celtic crafts, see: Homepage.